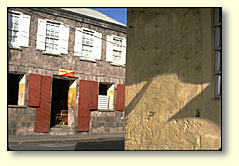 Charlestown is also the site of the oldest synagogue in the Caribbean. During the 1700's, 25% of the population were Sephardic Jews, who brought the latest in sugar cane growing and processing techniques to Nevis and the Leeward Islands, after being expelled from Brazil during the 17th century. Charlestown's Market Place is the hub of activity on Tuesday, Thursday and Saturday mornings, and the Cotton Ginnery close by, is active during cotton harvest time (March and April).